Aloo tikki is a popular snack made with potatoes. Generally it is served with the popular ragda patties and aloo tikki burger. 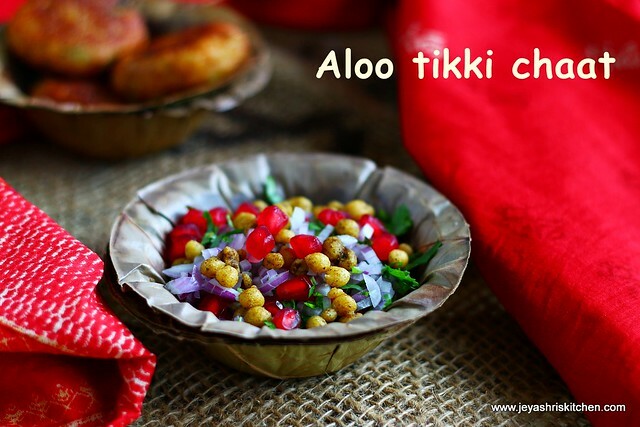 The another famous and popular way of serving aloo tikki is making Aloo tikki chole chaat., where aloo tikkis are made and served with channa masala. 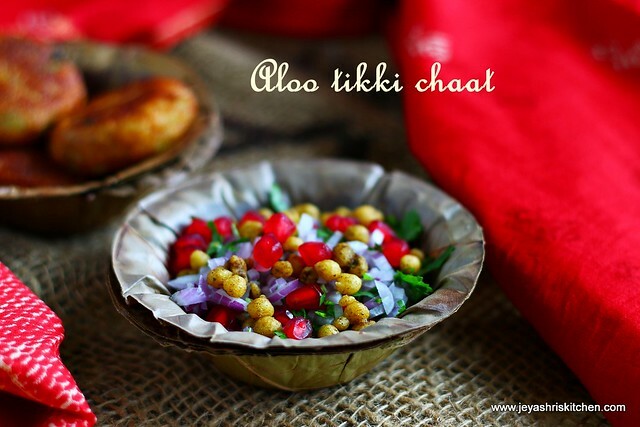 I first planned for that but finally ended up in making aloo tikki chaat recipe. I finished the photo shoot soon and gobbled the aloo tikki chaat immediately. This is a perfect snack for kids, once they come back from school. Give it a try this weekend and let me know how it turned out. Peel the skin and keep it aside. Mash the potatoes and keep it in a wide bowl. Just dip the bread slices in water and squeeze them nicely and take out all the excess water. I used white bread, you can use brown bread too. Tear it into small pieces and add it to the mashed potatoes. Add the red chili powder, salt, garam masala, cumin powder and amchoor powder. Add finely chopped coriander leaves. Mix well to form a stiff dough. The mixture will be sticky but do not worry, grease your hands with oil and mix well, it will be perfect. If you find it bit loose, add 1 tblsp of maida | all purpose flour to this. Take a lemon sized portion of the potato mixture. Grease your hands with few drops of oil every time you make the tikki. Flatten the mixture and make it into thick tikkis. The tikkis should not be flattened too much. Repeat this for the rest of the dough and arrange them in a plate. Keep this in the refrigerator for 15 minutes. Heat oil in a flat pan. Arrange the tikkis in the oil and fry on both sides. Alter natively you can make it in the dosa tawa with little less oil as i did in my aloo tikki burger post. Drain this in a kitchen towel. Aloo tikki is ready. Add yogurt, salt, red chili powder, chaat masala and cumin powder together in a bowl. Whisk the mixture well. Keep this chilled. Chop the onions, coriander leaves finely. Arrange the aloo tikki in a serving bowl or plate. I am showing here for one tikki as while i was taking the pictures it was 2 pm in the noon and it will be soggy if i make it that time and serve in the evening. Add 2 spoons of yogurt mixture on this. I am just roughly telling, if you like it more add little more also. Add green chutney to this as per your taste. Add the sweet chutney to this and garnish with some pomegranates. Add the finely chopped onions, coriander leaves and finally add the sev or boondi. You can make the aloo patties the day before and keep it inside the refrigerator or freezer. 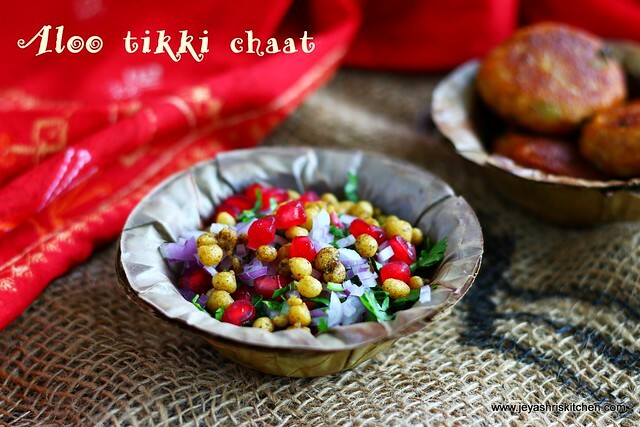 Instead of making yogurt mixture you can make channa masala and make it aloo channa chaat. You can skip the onions and make it a no onion no garlic version too.